We are a centrally located multi-therapy clinic providing Osteopathy, Physiotherapy, Acupuncture, Massage and Sports Injury Treatment in Bolton. Osteopaths are most popular for being backpain specialist and for dealing with issues such as neck pain, shoulder injuries, however they provide treatment for a variety of ailments. All Osteopaths registered with the General Osteopathic Council.em. Experienced HPC & Chartered Physios in Bolton, with a structural approach to treatment particularly rehabilitation for back pain, sports injuries, postural imbalance, work related and road traffic injuries..
Acupuncturist Martine Duma provides treatment for a variety of ailments, with a specialist interest in fertility, she is registered with the British Acupuncture Council, and sees a variety of people and injuries. In Bolton our Massage Therapist uses different to work on the deep layers of muscles and connective tissue. It is especially helpful for lower back pain and sports injuries. Sports/Deep tissue massage and Swedish massage are great for rehabilitation and relaxation..
Our sport injury therapists offer sound advice, assessment, treatment and rehabilitation to get you fit and back loving the sports you enjoy. Back Pain is the biggest complaint we see and something we are well suited to assess, treat, rehabilitate or manage. You may have been told you have sciatica, a slipped or prolapsed disc, which are all serious conditions, we look to see if we can treat the underlying problem and the reason for experiencing it. Why you have it can often be obvious but mostly its not. Sometimes the pain can be eliminated, sometimes its about management. If we feel further investigation is required such as an X-Ray or an MRI scan we will write a brief report for you to take to your doctor. Neck, shoulder and knee issues are also relatively common, as are postural problems from work. We have even seen children who spend too much time on the ipad/tablet/smart phone. If you’re looking for an Osteopath in Bolton, experiencing pain or you are not quite sure which treatment you need then give us a call or book in a consultation to discuss your needs and worries. Remember we may be known for treating backpain and lower back pain but offer a lot more such as helping tension headaches, sciatica, injuries, joint pain, neck pain, whiplash and postural problems. We also offer Sports Injury treatment from experienced practitioners, and deep tissue sports massage. In addition to helping with Osteopathy and Physiotherapy our sports massage therapist Gary Ashworth and Acupuncturist Martine Duma add to the great services. Our practitioners often work together to bring the best possible treatment at the right time for you. Between us we can put the best plan together and self help to achieve the best possible outcome. If you want to find out a little more of what to expect follow this link “What To Expect On Treatment“, or you you want some tis to get the most from your treatment follow “tip”. If you are a therapist and looking for a room to hire or join a team please get in contact. 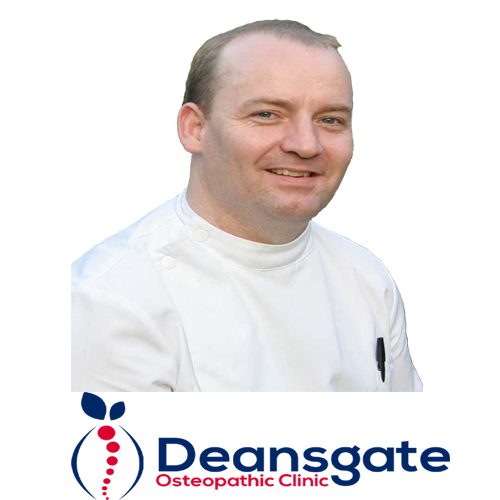 Owner and principal osteopath at the Deansgate Osteopathic Clinic, GOsC Registered Osteopath and Chartered/HPC Physiotherapist.